Maeve has heard it all before. She’s been struggling with severe anxiety for a long time, and as much as she wishes it was something she could just talk herself out of, it’s not. She constantly imagines the worst, composes obituaries in her head, and is always ready for things to fall apart. To add to her troubles, her mom—the only one who really gets what Maeve goes through—is leaving for six months, so Maeve will be sent to live with her dad in Vancouver. Vancouver brings a slew of new worries, but Maeve finds brief moments of calm (as well as even more worries) with Salix, a local girl who doesn’t seem to worry about anything. Between her dad’s wavering sobriety, her very pregnant stepmom insisting on a home birth, and her bumbling courtship with Salix, this summer brings more catastrophes than even Maeve could have foreseen. Will she be able to navigate through all the chaos to be there for the people she loves? First things first, I love the cover. It tells you a lot about this book without giving away much. I could tell it was going to be a LGBT YA book, and there is some sort of love triangle. So naturally I was like yes, I want to read this. And I loved the book. I loved that I was able to connect to the characters despite not being LGBT. Olivia, on the surface seemed like a spoiled brat, but she is more relatable than she seems. Zoey is on the complete opposite end of the spectrum. She is poor, and works hard to get what she and her family needs to survive. Now the idea of a rich person sweeping in to help lift a poorer person out of their personal hell is nothing new, however Amanda Grace gives it a nice little twist. I thought that having the two come together initially to work on a group project was a cute idea. And then to throw the twin brother as a potential love interest was nice. 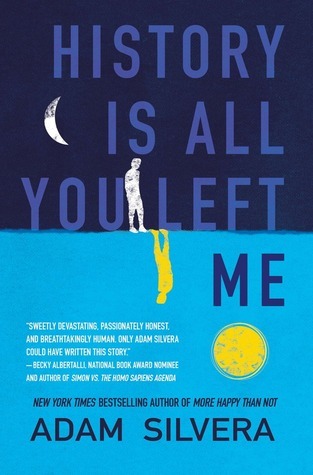 I liked how the book didn’t address the social stigma of being gay as much as some other books have in the past. There was very little worry as to how society would see them and if they would be accepted. The concern was how do we tell Liam and not lose him as a friend. I love that. I think that really demonstrates how have we as a society have come in the last 5 years in regards to LGBT relationships. I bow down to you Amanda Grace, thank you, thank you, thank you. The story and the development of the characters was great. I thought it flowed nicely and liked that the attraction was not instantaneous. It is refreshing to read a YA book that the characters do not have that whole love at first sight syndrome. The only negative was that I wanted slightly more from the Liam and Olivia dynamic. It lacked some feeling and depth. But other than that I thought the book was great! Guest Review for LGBT History Month is provided by Cassie! Cass and Jess met back in Graduate School when they were both pursuing their Master’s Degree in English Literature. They’ve been friends ever since. As a graduate student of English literature, I spent most of my career ensconced in the Renaissance era, happily devouring poems and plays and studying delightfully weird science texts and recipes from the 16th and 17th century, and I have a special place for all things Shakespeare and Shakespeare adjacent in my heart of hearts. As such, I love a good Shakespeare retelling. 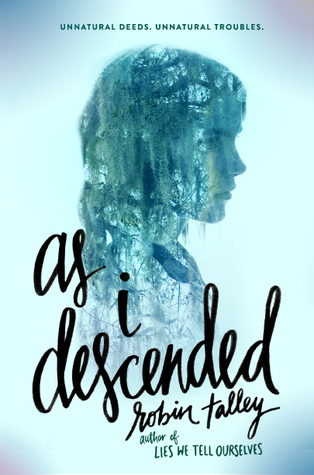 And let me tell you, As I Descended is a great Shakespeare retelling. 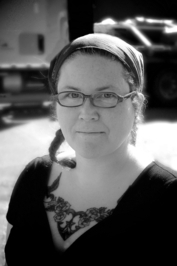 The author writes in her acknowledgements that she wants to write a Macbeth with ghosts and gay people (which are two of my personal absolute favorite things) and she definitely succeeds at doing that – there are an abundance of both in the text and both the ghosts and the gays represent a diverse spectrum; the novel takes place on a restored Virginia plantation, which is rich in history and legends and horrors, but two of the prominent LGBTQ characters are of Hispanic heritage, and I was pleased with the weaving of Hispanic folklore with that of the Old South. I think that what I really enjoyed most about this novel was the fact that as a reader, you don’t at all have to be knowledgeable with respect to Shakespeare and his plays to enjoy the book – it stands alone as a good read and a great story – but if you are familiar, it just heightens the enjoyment of the novel. As a Shakesqueerian scholar, I love, love, love the homages to the Bard within the text, and how the chapter titles are lines from the play and elements of the hauntings within Acheron Academy are dripping with bloody good nods to the play itself. The narrative stands well on its own as a modern ghost story, but pairing it together with Macbeth makes it tenfold more appealing. Knowing the play so well can serve as a double edged sword – or dagger, if you will – hanging over your head as a reader; if you know what happens in the play, you know relatively early on which of the characters within the novel will meet a most tragic end. And, ultimately, I found that I didn’t want those characters to meet a tragic end – and maybe that is my own personal bias, as 2016 has been a terrible year for lesbian characters and LGBTQ representation – the “bury your gays” trope has ruined some fantastic characters and storylines, but here, in this space, with these characters, it’s to be expected – but that doesn’t make it any easier to digest, which I think is a great testament to the quality of writing by Talley in this novel. As I read, I found myself feeling particularly sympathetic towards Lily, our Lady Macbeth (who, interestingly enough, to me at least, goes more the way of Ophelia from Hamlet, in a haunting scene on the cursed lake, than how I envisioned her off-stage death in the play itself), which given the nature of her character, I am uncertain as to whether sympathy is the right emotion to feel for her. Despite knowing going into this that everything is going to end horribly and tragically, because Macbeth, the road to hell is worth riding on, and I would highly recommend giving this book a read. Be sure to check out our Calendar to keep up with LGBT History Month here on A Midsummer Night’s Read! 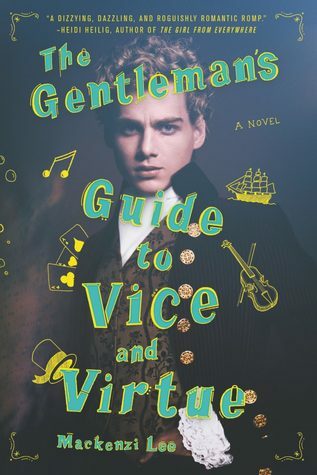 Seventeen-year-old JT Barnett lives a humdrum existence in Clearwater, FL, working in the family gas station, drifting through school, and dreaming of fabulous days to come. His one attempt at drag led to public humiliation in a school talent show, so he is reluctant when Seth, his wildly attractive, overachieving boyfriend, encourages him to enter the Miss Drag Teen pageant in New York City. The prize of a four-year college scholarship ultimately convinces JT, and after lying to their parents, he, his best friend Heather, and Seth embark on a spring break road trip that leads to fights, honest reckonings, and encounters with a cast of remarkable personalities. With the exception of spiteful Tash, the diverse group of pageant contestants offer JT acceptance and a tantalizing glimpse into a brighter world. I am a massive fan of drag queens and drag in general, in the past year alone I’ve been to three drag shows, one drag brunch, and have binge watched RuPaul’s Drag Race countless times. So when I got wind of this book, and Jeffery Self, being at the Texas Teen Book Festival, I knew I would absolutely love the story. I was not disappointed at all. The narrative is mostly focused on JT’s struggle with accepting himself as who he is, back rolls and all (eyes Alyssa Edwards), and coming to realize that if you start to live in the moment then things can really start to happen for you. Yes, this is a very positive LGBTQ book, and I love that. But I also love that other than a few mentions of name-calling, that this was a personal journey of self love and discovery than it was someone trying to grapple with their sexuality—not that it’s a bad thing to have that narrative—I just was pleased to be reading one that was more focused on the individual. In addition, as someone who has struggled with anxiety and crippling self esteem issues, I related so much to JT and his journey. JT is in a happy relationship with his boyfriend of almost 4 years, and has been out and proud for a while. It’s really just his self doubt that holds him back, well, that an the lack of money. Shenanigans happen and JT finally gets to leave his bubble of Clearwater, FL and goes to the Big Apple to compete in a teen drag pageant. I don’t know about you, but I have helped a friend dress in drag for an amateur drag show and it was so much fun, so it brought back some happy memories. Clearly there are some characters that were blatantly based off of some of the queens from RuPaul’s drag race, and I totally loved it. I’m talking about the Pip/Adore Delano hybrid (PARTY), and the bitchy Tash that reminds me of Coco Montrese. I loved this book. The writing is punchy, upbeat, and the pacing is excellent. 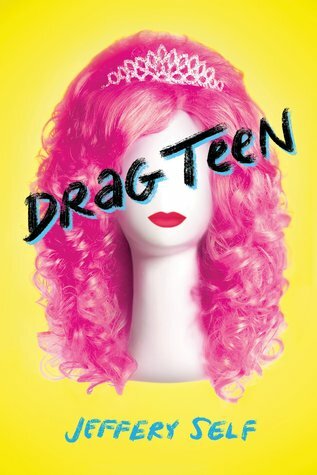 Do yourself a favor and get into Drag Teen. You won’t regret it! How I have owned this book since it was released in 2014 and not read it before now is definitely something I’m kicking myself for. 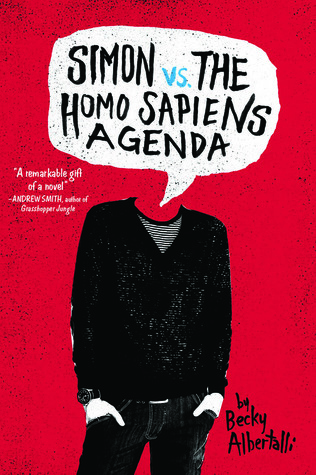 Not only does Simon vs The Homo Sapiens Agenda touch on all of the things that a good LGBTQ novel should: the aspects and emotions that come with Coming Out, what chaos can be caused by being Outed by someone else, and the joy in being accepted by those who love you. ALSO, falling in love for the first time. Albertalli’s writing is succinct and fast-moving, so much so that I couldn’t put it down and I read this book in one three hour sitting. Also, all of the snark and sarcasm. Simon is a wonderfully complex character, and the relationships between him and his friends are well developed and equally complex. It all flows together so well. 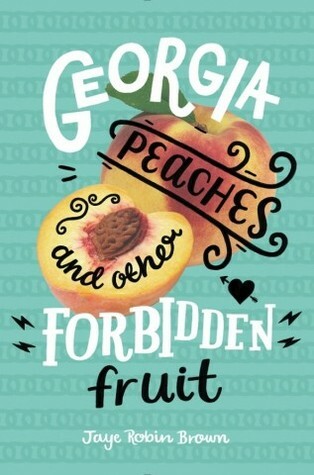 I just applaud Albertalli so much for her skill in writing. It turns out that the author is actually a child psychologist – don’t worry, she doesn’t base any characters off of any of her clients (patient-doctor confidentiality), but is inspired by those she has gotten to know over the years – so it shouldn’t surprise me that she is excellent at developing these complex characters alongside her complex narrator/protagonist. The narrative structure rotates between first person limited Simon and chapters that show the email exchanges between Simon and his crush, Blue. I think this was one of my favorite narrative devices that I’ve read recently, (and again, I should have read this book a long time ago! SO GOOD) because it really shows how deep the friendship between the two of them is and it also shows the reader how their relationship progresses and it helps the reader fall in love with Blue alongside Simon. I applaud Albertalli’s fearlessness when discussion teen drinking, masturbation, and first sexual experiences. Not to mention all of the cussing. I love all of it. It makes the narrative so much more realistic and relatable to the reader. As a straight, cis woman, I just loved how realistic and emotional Simon’s journey was throughout the whole novel. He struggles with the need for approval but also his privacy. He is a normal teenager lusting after his crush, defining his emotions, and finding who he really is. It was also important for me to really see how much it affected Simon that he didn’t get to choose how he came out, he was forced “out of the closet” by an angry kid in his class. It was despicable and very hard to read, I broke down into tears for Simon and for his agency that was taken away from him. All the high fives for the diversity in this novel, not only with two gay main characters, one of them is a person of color, a person of color is Simon’s best friend, there’s a Jewish main character, and a bisexual character. It really does exemplify the melting pot that is Atlanta and America. I adore that the two of the couples in this novel are interracial and it is not a big deal. Because it isn’t. The south has all of these old, ridiculous prejudices and I love that it just wasn’t a major issue in this book. Keep following along with us for Midsummer’s LGBT History Month Celebration! OCD-afflicted Griffin has just lost his first love, Theo, in a drowning accident. In an attempt to hold onto every piece of the past, he forges a friendship with Theo’s last boyfriend, Jackson. When Jackson begins to exhibit signs of guilt, Griffin suspects he’s hiding something, and will stop at nothing to get to the truth about Theo’s death. But as the grieving pair grows closer, readers will question Griffin’s own version of the truth both in terms of what he’s willing to hide and what true love means.